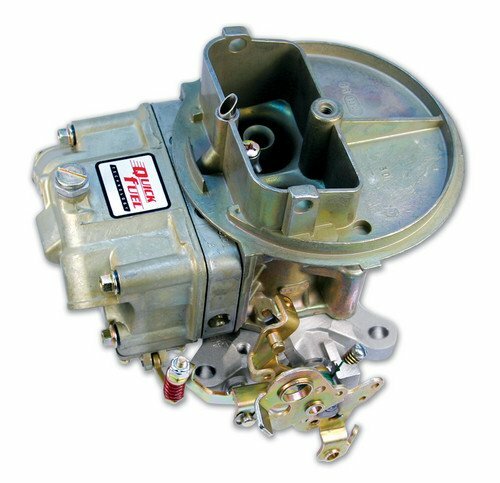 While modifying a street carburetor for circle track applications can work reasonably well, Quick Fuel Technology's Q-Series circle track carbs eliminates the guesswork and offer substantial advantages in adjustability, consistency, and predictability. Since racing around a banked oval pushes fuel to the passenger side of the car, Q-Series circle track carburetors feature die-cast aluminum fuel bowls with internal baffles that eliminate slosh. The bowls also feature an integrated fuel chute that substantially reduces aeration, and directs fuel toward the main jet pickup area. To assist in flattening out the fuel curve, screw-in air bleeds enable fine-tuning of both the low- and high-speed systems, while a proprietary booster design enhances carb signal without restricting high-rpm airflow. Helping drivers put the power down is an adjustable QuickLink system that allows changing the opening rate of the secondaries to 40-, 60-, or 100 percent. Circle track Q-Series carbs are available in 6 different sizes ranging from 650-1,050 cfm for both gasoline and alcohol applications. All Q-Series circle track carburetors are equipped with roller bearing seals which provide smoother throttle response, less wear on shaft, and longer life.